“Rachel Reed confidently and quietly sets high expectations for herself and proceeds to reach them. From academic achievement to performing arts, student leadership and community service, Rachel aspires to do her best. Through her positive attitude and diligent work ethic she achieves her goals.” Dublin High School principal Carol Shimizu. On Friday February 24, Dublin High School senior Rachel Reed learned that she was the City of Dublin’s 2011 Young Citizen of the Year for her community service and volunteerism. As noted in the nomination letter that led to the award (see below), Rachel has been an active Girl Scout for 13 years and achieved the highest Girl Scout recognition, the Gold Award, by planning the first ever Dublin High Battle of the Bands event. The event was so successful that she recently organized the second annual Battle of the Bands, and doing so has inspired her to pursue a career in music management in college. Rachel also tutors students in math and volunteers at the Open Heart Kitchen among her many volunteer activities, while serving as President of the Irish Guard (Dublin High’s music program) and maintaining a 3.8 GPA. 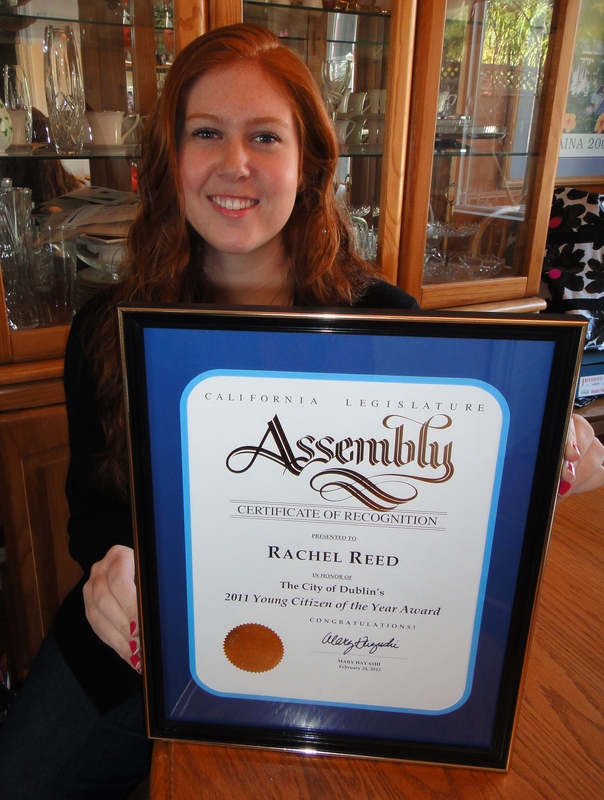 Rachel is a California Scholarship Federation life member for academic achievement. Also recognized at the event were Edwin Osada for 2011 Citizen of the Year and OneDublin.org for 2011 Organization of the Year. The annual event was held at the Shannon Center, where nominated citizens and organizations, and their guests, enjoyed an evening of festivities. A full list of all award winners and the nomination letters is available here. OneDublin.org recently met with Rachel to learn more about her volunteer activities that led to the Young Citizen of the Year recognition. In the interview, Rachel encourages middle school students entering high school to pursue their passions, and that it is possible to be involved in school activities and the community while achieving academic success. Rachel Reed is an outstanding young woman of impeccable character. She is unusually caring, responsible and respectful. She is self-disciplined, hard-working individual who always gives her best effort. Her leadership skills, organizational abilities, and personal trustworthiness are recognized by staff, peers and members of the Dublin community. Among Rachel’s many outstanding traits are her community-minded spirit, positive attitude and modesty about her accomplishments. She has been a Girl Scout for 13 years and active in all aspects of music. She earned her Gold Award for Girl Scouts, the highest honor a scout can achieve, by planning the 1st Annual Gael Rock – Battle of the Bands – a district-wide music event in 2011. She co-coordinated and directed all aspects of the event to promote the importance of music education. 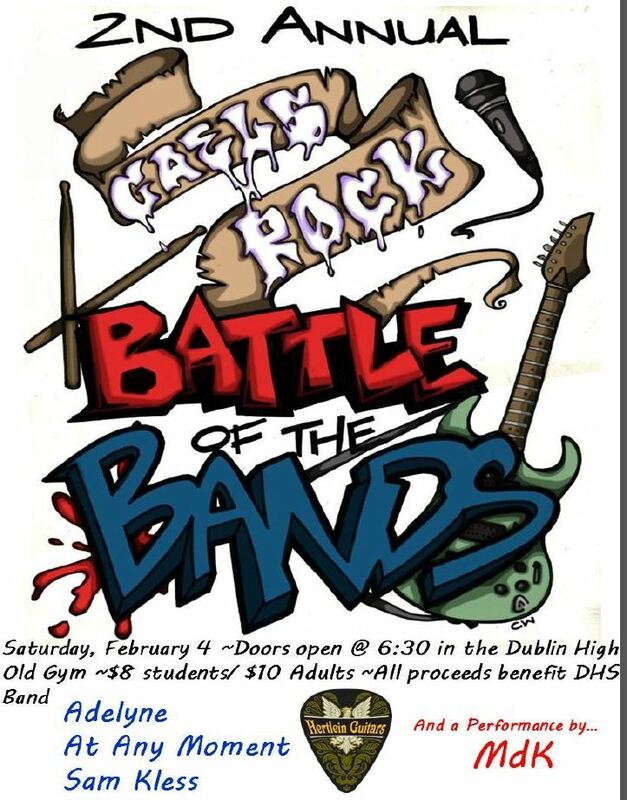 The proceeds went to support the Dublin Unified School District elementary music program and toward the purchase of a $4,000 marimba for the Dublin High School concert band. She is currently in the process of planning the 2nd Annual Battle of the Bands to be held in February 2012. Rachel conscientiously volunteers her time and shares her talent in the community. She tutors freshmen and sophomore students in mathematics after school two days a week; she serves meals at the Open Heart Kitchen. During the holiday season, she participated in the Santa’s Breakfast for Dublin children and the Christmas party in Richmond, CA, for under-privileged children and their families; she also worked with special education students on making Holiday cards. Rachel has taken a broad set of courses over her four years, which shows her interest in learning and her aptitude across the spectrum. She has an excellent record of academic achievement as reflected by her high test scores and 3.8 grade point average. She is a California Scholarship Federation life member. Rachel aspires to earn a college degree in music management with a career goal to promote music as an important artistic and developmental tool for young students. Rachel has performed in the DHS Marching Band, concert band, and percussion ensemble for four years. She currently serves as president of the Irish Guard. In addition, Rachel has been on the DHS swim team all four years. She has been employed by the City of Dublin as a life guard and currently works at the Senior Center. I cannot think of a candidate more deserving to be the Dublin Young Citizen of the Year. Rachel Reed is a diversely talented, amazingly giving person who is definitely worthy of this honor.